The world of energy efficiency is one that is ever-growing. It’s no secret that technology for a greener world has grown exponentially in the past decade, and it’s exciting to see it implemented in dairy farms across the region. AGPROfessionals helps local farmers with agricultural development projects in Colorado and surrounding states. Based in Greeley, our consultants can travel to your farm to offer environmental consulting and economic development plans that can help transform your dairy farm from an energy-sucking wasteland to an efficient, lucrative farm. You can’t make adjustments to your energy consumption without knowing how it is used. An energy analysis is an assessment of the entire farm to search for opportunities to reduce energy and costs. The next step to going green is to be conscious of conserving energy. Turn off lights in rooms nobody is in, regulate the thermostat for a more tolerable temperature (cooler in the winter and higher in the summer), and unplug equipment that isn’t being used. These are just a few quick ways you can start conserving energy around your dairy. Now it’s time to work smarter not harder. Energy efficiency is about finding the opportunities to perform the same service with less work, meaning less energy and more savings. This may include substituting old equipment with newer models that are designed to use less energy. Energy companies may charge differently for using the same amount of energy during different times of the day. To capitalize on this, it is advised to run equipment during the off-peak hours and keep things shut down during the expensive peak times. 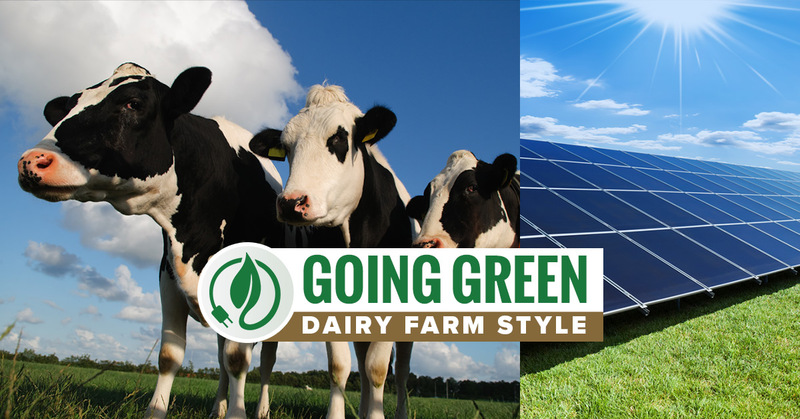 Finally, generating your own energy is one of the best ways your dairy farm can go green. This is a costly investment up front, but over time, the return on your investment is always worth it. From solar panels to wind power, methane digesters, and hydroelectricity, creating your own energy is both naturally and fiscally admirable. Our agricultural development team draws on our 20 years of real-world experience that we’ve acquired by helping farmers just like yourself transform their current properties into efficient, lucrative businesses. We work on projects of all sizes and are happy to help you begin your environmental transition with an energy audit. Then, we can work together to apply new ideas to your problems all the way from inspiration to application and operation. Whether you operate in a small local area or serve a state, national, or international clientele, we can help you achieve your goals in going green.